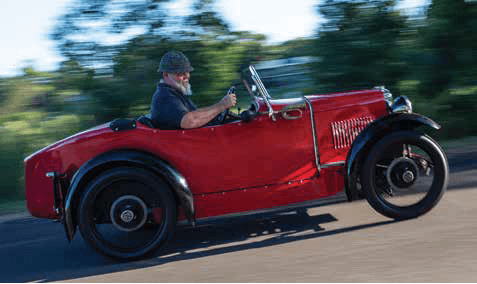 At 90 years young this MG Midget ‘M’ Type is a wonderful Australian survivor. What do you get with a modern two-seater sportscar? Typically excellent performance, hopefully, a racing pedigree, lightweight and an accepted compromise on cabin space. Above all, it has to look great, bring a smile to the face of driver and passers-by, and for the ultimate experience, be open to the elements. If it’s painted red – the fastest colour – that’s a bonus. 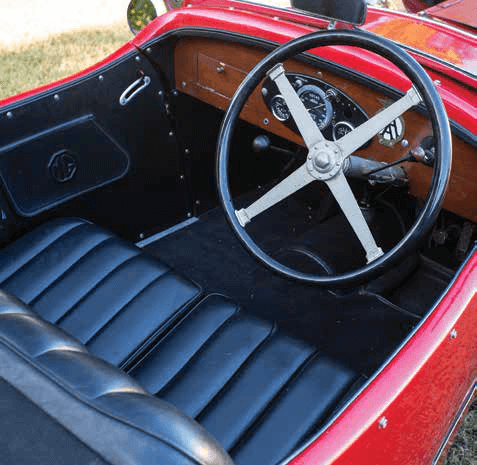 It may be 90 years old, but these 8/33 MG Midget Sports ‘M’ Type shows core sportscar elements haven’t really changed since the 1920s. Here was a tiny car built for racing and cheap road transport, weighing less than half a tonne, capable of over 100kmh and a target for any chap keen on impressing a young lady with a romantic roof-off jaunt into the countryside. It’s clear he has special affinity for his 1930 ‘M’ Type, one of about 25 known in Australia. Everything about it is ‘Midget’, from its tiny 20bhp 847cc four-cylinder engine to its external dimensions, seats, pedals and three-speed gear lever. Tony explains it was built for British people of 100 years ago who were markedly smaller then, and, not being a short man, the current owner’s head rides well above the top of the windscreen. 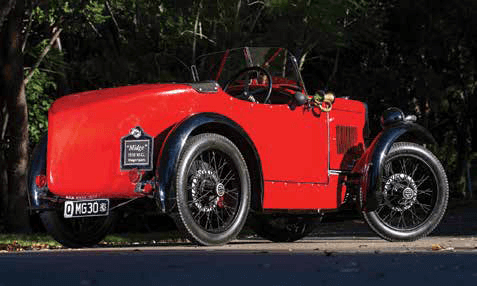 The ‘M’ Type was the car that really put MG on the map. MG’s previous models were built only in the hundreds, but some 3235 ‘M’ cars were built, mainly two-seaters or coupes with metal or more popular fabric bodies. 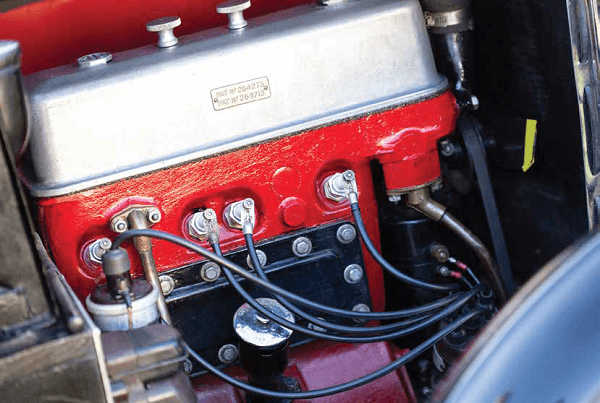 Production lasted from 1929 until 1932, with sporting owners no doubt lured in by the model’s appearances at the Le Mans 24 Hours, Monte Carlo Rally, hill climbs and racing on the banked oval at Brooklands. Tony wrote to the Triple-M Register in the UK to check factory records, and incredibly the engine number from the owner’s book matched the car being restored. “After however many years, the handbook and the car had been reunited,” Tony said. The ‘M’ Type was on the road again by 1999, and Tony said to the restorer to keep him in mind if he planned on selling it. The call came in 2014, Tony paid the asking price and the little sports car was now in his collection. “I tracked down the son of A.B. Gillespe and he gave me a photo of the car from 1934 and some medals his father had won in the MG from Queesnland hill climbs and reliability trials,” he said. As a former racer whose career was cut short after 45 per cent full depth burns froma 1983 accident at the Surfer’s Paradise circuit, this motorsport link was an added bonus for Tony. Tony says he went back to first principles. He saw the camshaft had been welded up several times and the lobes were all different shapes. He used Tighe cams to grind him a new camshaft, had new valves made in Brisbane but didn’t grind the head “because I wanted to keep as much life in the head and engine as I could, so didn’t go for high compression,” he says. Tony’s spent time repairing the axles, securing the steering arm nuts properly and the nightmare job of rewiring. The skinny 19×2.5-inch tyres are over 20 years old but on black wire wheels look superb under the red body. Incredibly, the skin is still original, although the timberwork has been replaced. The ‘M’ Type was imported complete minus its body tub to avoid complete car duties, and it’s believed a Brisbane coachbuilder built the one-piece aluminium body. Note it has only one door on the passenger side, helping save weight for competition use. Watching and hearing this lovely old ‘M’ Type in action you’d forgive any of its quirks, though. Back in the day these were fast, talented and fun sportscars, and although our idea of speed may have changed in 90 years, the fun bit hasn’t. Little wonder it never ceases to bring on a smile.